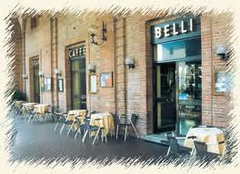 This morning Rob & I went to do some shopping in Amandola and stopped for a coffee at Gran Caffe Belli in Piazza Risorgimento. Rob had a hot cappucino and I had a really good cup of tea which came with a plate of chocolate-dipped shortbread biscuits on the house. Total cost? €2.40! Having just been in Sydney where a cappucino cost $3.50 (about €2.80) we were happy to be home!